Framecrafters is a performance motorcycle fabrication shop located in northwest Illinois. Originally a design and fabrication shop for chassis only, Framecrafters has methodically expanded their focus to the entire motorcycle. While still specializing in frame and associated parts fabrication, Framecrafters also offers their expertise of building, converting, and restoring motorcycles for their customers. Randy, Justin, and Karsten are life long motorcycle enthusiasts who ride and race. Street, trail, track, each type is viewed by Framecrafters as an important part of motorcycling that should be fun and exhilarating. From building a ground up racer to resuscitating your old street bike, Framecrafters is proud to offer their services to help realize your vision. Built on a 1998 Buell Lightning this bike underwent the full custom FC treatment. A long term project at FC that was finally wrapped up this past fall and now making its formal debut ! Initially a simple job just requiring a subframe and seat mod, it slowly evolved into a complete high-end custom project. Focusing on complimenting low profile ergos, high-end components and hand made parts there were no short cuts to take. A WFO 100hp pro-street 1250cc engine finishes the build making for an exhilarating and fun ride ! 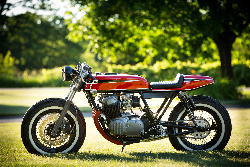 1972 Honda Cb750 "R" build incorporating a wide spectrum of design and technology. Keeping true to some of the tradition CR styling a retro wheel set is coupled to top shelf suspension. An 836cc SOHC engine carries the classic-modified chassis and running gear to a significant higher level than the factory. Motogadget electronics, many custom FC billet parts and a custom paint job completes the project. Photo Credit; Paul Elledge Photography. Starting with a Yamaha Yz450f motocross machine, Framecrafters modified the stock frame to accommodate the Yamaha 2-stroke twin 350cc Banshee engine. 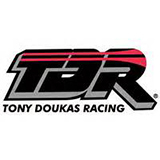 Working with Tony Doukas Racing, Tony built a special 465cc engine producing 110hp+. Finished with numerous top-shelf components a new breed of Motard machine is born. Fans, customers and friends interested in following current Framecrafters events, racing and projects please visit us on Facebook and Instagram. Framecrafters now has access to water jet cutting services. This process uses an abrasive water jet to make precision CNC cuts on all tpyes of materials. Visit Torg E for more information.